Valerie was called to the Ontario Bar in June 2018. 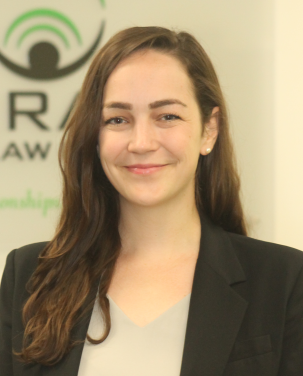 Originally from the East Coast, Valerie moved to Ottawa to receive her Juris Doctor from the University of Ottawa, graduating with the Option in Law and Social Justice in 2017. Prior to attending law school, she obtained a Bachelor of Science degree with Honours in Biology and International Development Studies from Dalhousie University. During law school, Valerie worked at the University of Ottawa Community Legal Clinic as a caseworker and Division leader in the Community Legal Education and Outreach Division. Valerie sat on the Clinic’s student hiring committee and was awarded the 2017 Greenspon, Brown & Associates Prize for outstanding contribution to the Clinic. She also served as a University of Ottawa Common Law Ambassador and as a mentor for the Women’s Legal Mentorship Program. Valerie completed her Articling placement at Gerami Law PC between August 2017 and May 2018, and could not be happier to continue working at Gerami Law PC as a Barrister-at-Law. Outside of the office, Valerie enjoys volunteering, going to spin class, running, playing volleyball, watching hockey and reading.